Nagios monitors the network for problems caused by overloaded data links or network connections, as well as monitoring routers, switches and more. 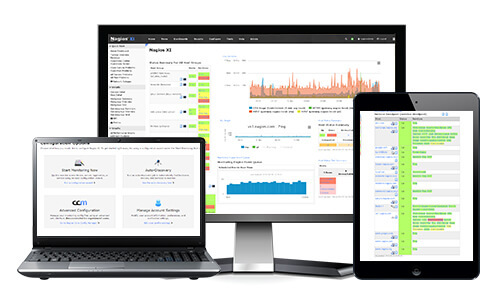 Easily able to monitor availability, uptime and response time of every node on the network, Nagios can deliver the results in a variety of visual representations and reports. MSPs and IT departments can select which incidents trigger OnPage high priority messaging to individuals or groups via a secure application on their mobile devices. Users can also monitor delivery of alerts as well as responses in real-time from within the Nagios console. OnPage’s Alert-Until-Read™ technology assures no more lost alerts that waste valuable time and money. The OnPage and Nagios Integration provides integration at two levels; Email integration and web services integration. Email integration provides users with an immediate, no code required drop-in solution that bridges current Nagios email notifications with the OnPage platform. All OnPage users (both individuals and groups) have a unique OPID (OnPage ID). By sending an email or SMS text to the address [email protected] the message will automatically be converted to a secure OnPage alert and will appear in the recipient’s mobile device. By simply designating an OPID email address in Nagios notifications the systems will be linked. Nagios users can monitor all priority messaging created by Nagios in the OnPage console. Nagios users can quickly and easily implement a deeper level of integration with OnPage by installing the OnPage HUB API Client Module. This module, installed by downloading and installing an OnPage supplied Python script, enables the addition of OnPage as a notification method in the Nagios console. Users can then select OnPage as an option for automatic alerting of user-specified OnPage clients based upon notification settings within the console. Communication is via web service calls to the Nagios HUB API. For further assistance on integrating OnPage with your instance of Nagios, please contact OnPage Support.